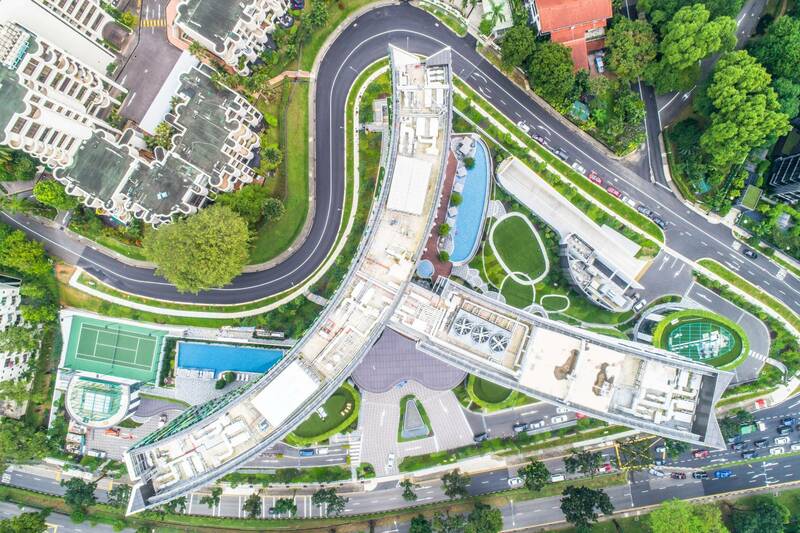 Awarded Gold in the 2018 Melbourne Design Awards for its creative architecture, the Novotel Singapore on Stevens and Mercure Singapore on Stevens building tells a unique story from the aerial view to the elements around the hotel. 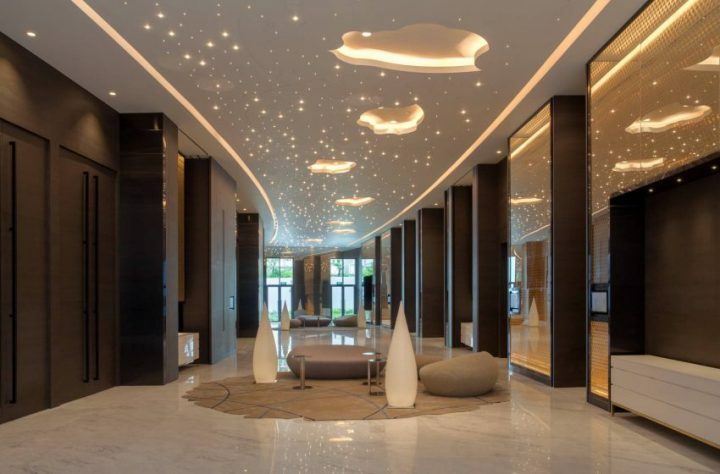 Having a grand vision of the interconnectedness of people and the universe, the design of the hotel narrates a story of the “Power of Ten”. This concept illustrates the idea of 4 levels of perspectives – people, nature, atmosphere and the universe. From an aerial view, the facade of Novotel Singapore on Stevens and Mercure Singapore on Stevens forms a Chinese character, 人, which means people in Mandarin, and represents the humanity found in hospitality, a service industry that fulfils the fundamental human needs for food, shelter and rest. 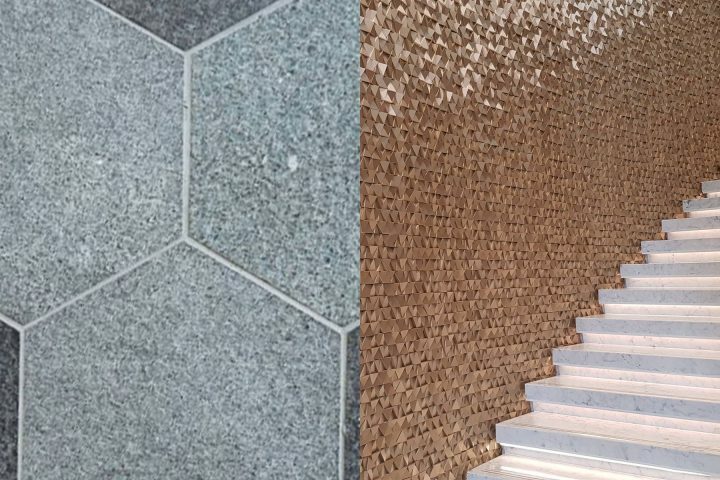 Like the 人 facade that is strong and withstands the different weathers, at this hotel, we are reminded that it is people who built and work together to form the foundation of the impeccable hospitality service provided to all guest. The elements of 人 can be found all around the hotel, from the floor tiles to the decor on the walls. From the aspect of people (人), zoom out by the Power of Ten and be amongst plants and nature. 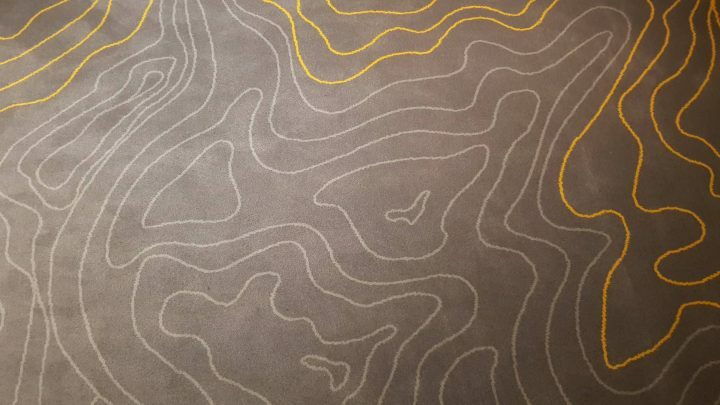 Resembling contours found within tree barks, these designs are weaved into the carpets within the hotel. From an external aerial view, the ground floor concept is designed as a series of organic glass pods which accommodate dining, hotel functions and commercial spaces. These pods spill out from under the hotel tower, like pebbles sprinkled over a lawn, engaging with the surrounding urban context. 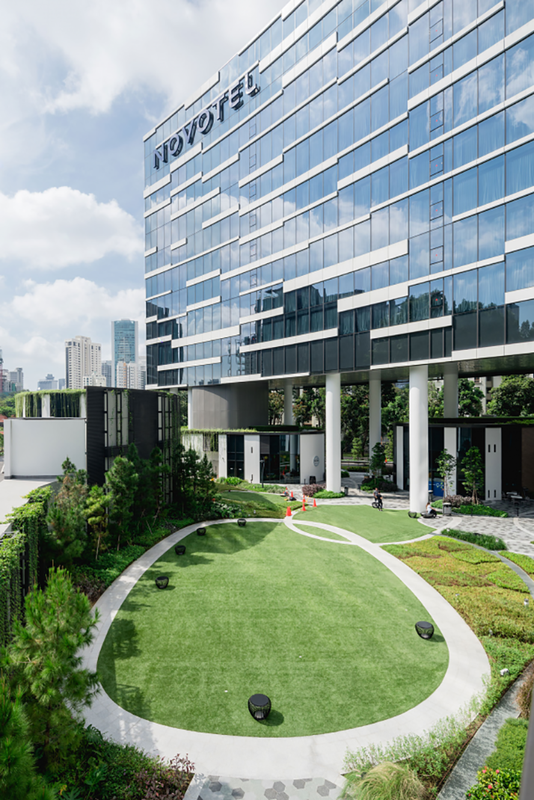 Be surrounded by the lush greenery around the grounds of Novotel Singapore on Stevens & Mercure Singapore on Stevens and enjoy what nature has to offer. This symbolises the connectedness between people and nature, providing a gentle reminder to all who visit this hotel to take care of the one and only Mother Earth humans need more than ever. Zoom out by the Power of Ten from nature to the atmosphere. 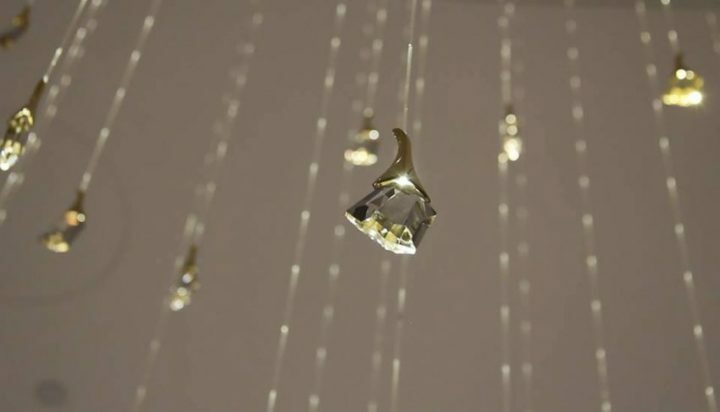 Inspired by the warm rain showers Singapore often gets, let the Chandelier called “Summer Rain” enchant you as you enter the lobby of Novotel Singapore on Stevens. Powered by many tiny energy saving LED light bulbs, the ivory hued chandelier maintains a semblance of whimsical atmosphere. Zoom out by the Power of Ten once again from the atmosphere to the universe, and find yourself amongst the stars. Look up, the different constellations are sparkling like diamonds above you. The Milky Way foyer is the common space that connects all 6 meeting rooms and the Grand Polaris Ballroom. This area is furnished with pebble-like sofas, representing warm and friendly gatherings that happen around a campfire beneath the stars. This imagery zooms us back into focus, back to fundamentals of human relationships and connections, intrinsic to the human aspect. The symbolism of the 4 different perspectives represents the importance and impact humanity has on nature and other people. From the design of the facade, to the elements around the hotel, we are remind that people are at the heart of everything we do at Novotel Singapore on Stevens and Mercure Singapore on Stevens.